There are many different types of optical effect that have fascinated and entertained all ages for centuries, from the camera obsucra and peep boxes of the 17th century through to the 'magic eye' books of the 1990s. In each case, the optical effect or 'illusion' has inspired creative and entertaining ways in which they could be used by the public and are still sought after by collectors today. The early 17th century peepshow or peep box altered the viewer's depth of perception and by changing the lighting from the front to the back of the image, and would change the views from day to night. These prints became more sophisticated in the 19th century and changed from one image to another, like Spooner's Protean Views No 30, Greenwich Hospital changing to the Battle of Trafalgar. 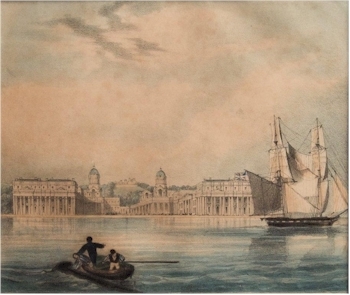 Spooner's Protean Views No: 30 - Greenwich Hospital changing to the Battle of Trafalga, circa 1840. Optical toys became more popular in the 18th century by the use of the Zograscope, which altered the depth of view of a flat image. Vue d'optique prints had to be reversed so that the obvious titles could be read the correct way when viewed. Though they were mainly landscape images, they were hugely popular in well-to-do houses in the late 18th century. A late Georgian mahogany and chequer strung zograscope. In 1817, Sir David Brewster patented his version of the kaleidoscope after conducting experiments in light polarisation (image 95) and they became extremely popular. From the simple cardboard versions to more elaborate desk top versions with phials of coloured liquids, collectors are keen to acquire unusual examples from the 19th century. The Thaumatrope was another popular 19th century optical toy that was produced in large numbers and sets of images. An early 19th century thaumatrope of Napoleon Bonaparte. 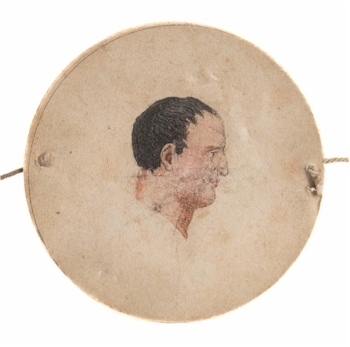 One side of a paper disc was illustrated with part of an image and the reverse with a different part of an image. By rotating the disc the image became whole due to the persistence of vision. In some cases it could look like early motion and is sometime credited as an antecedent of animation. The Phenakintoscope, developed in 1833, produced a more fluid short animation by the rotation of a disc with a series of images and an equal number of slots in the disc. Though it could only be viewed by one person at a time, original published magic discs are very desirable. 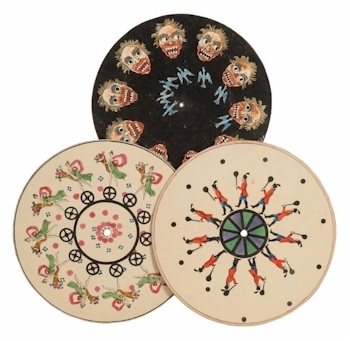 Phenakistoscope: a collection of three 7 inch 'magic discs' comprising a version of 'Ceres on a wheel' after 'Alph, Giroux et cie , Paris' circa 1830s, one of a man with racket and ball after W Soffe, circa 1830, the third of a bird flying into a man's mouth. The earliest type of stereoscope viewer was developed in 1838 by Sir Charles Wheatstone, which used two images reflected on mirrors set at an angle. 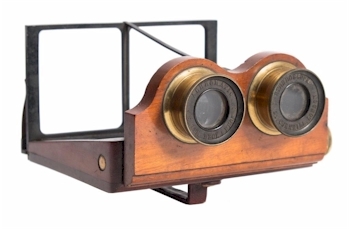 Though this allowed much larger images to be viewed, the Brewster style stereoscope was more practical as it could be held by hand. 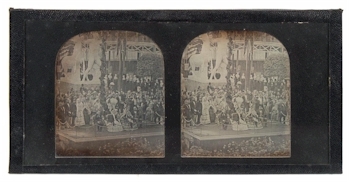 After a stereoscopic picture of Queen Victorian was displayed at The Great Exhibition in 1851, there was an overnight explosion in demand for stereoscope viewers and the market for producing views of many varied subjects. A mirror stereoscope by Smith Beck and Beck. A rare stereoscopic daguerreotype of the visit of Napoleon III and Empress Eugenie with Queen Victoria and Prince Albert to Crystal Palace, Sydenham , 20th April 1855, by Negretti & Zambra. 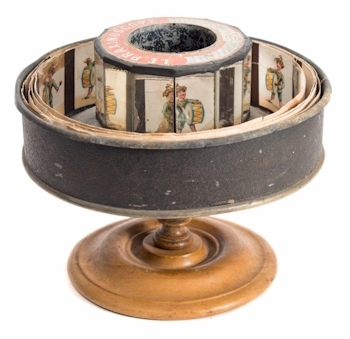 The definitive version of the Zoetrope was developed by William Ensign Lincoln and Milton Bradley in 1865. The replaceable strips had the slits above the image inside the drum, allowing more than one person to view at a time. Image sets were produced by the London Stereoscopic and Photographic Company who also produce a series after George Cruickshank in 1870. A Victorian 'Wheel of Life' Zoetrope by the London Stereoscopic and Photographic Company. 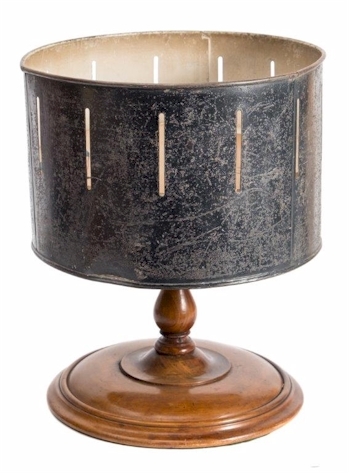 In 1877, the Praxinoscope improved upon the zoetrope by having a set of mirrors in the centre of the drum to reflect the images. This allowed for a brighter image to be viewed and was developed by its inventor Charles Emile Reynaud into a version capable of projecting the images to a larger screen in 1892. A late 19th century 'La Praxinoscope' by EC Reynaud. 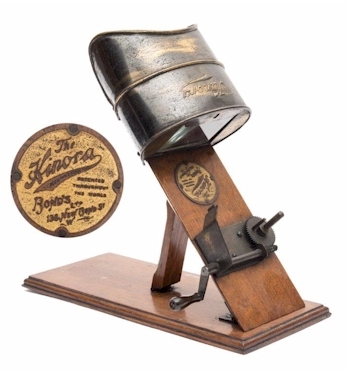 At the same time the Kinora viewer was being developed by the Lumiere brothers Auguste and Louis. Alongside their work on the Cinematographe, the Kinora viewer was a series of images on a drum, working in the same manner as a flick book, they were seen sequentially giving the appearance of motion. 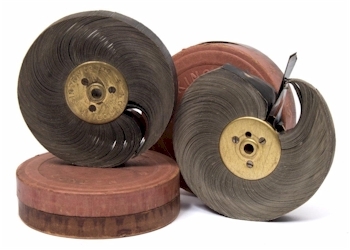 Though popular at the beginning of the 20th century , the Kinora viewer became less popular as the cinematograph and early cinema became the most popular form of entertainment and still continues to this day. There are many more optical illusions and optical toys such as lenticular images, ombro-cinema and mutoscopes that are also popular with collectors. The vast range optical toys and optical effects and applications over the centuries make it a diverse and fascinating area for collecting.